Comments: White-tailed deer are smaller and more numerous than mule deer in Kansas. They have relatively short ears and are tawny brown in color. Their bushy tail, brown above and white below, "flags" from side to side when they are running. Whitetails are excellent swimmers, can run 35 miles per hour and jump an 8-foot fence. During severe winters whitetails gather in areas near abundant food and cover. Bucks have antlers with 3-6 unforked points on each beam. Antlers start growing in spring and are shed in late winter. 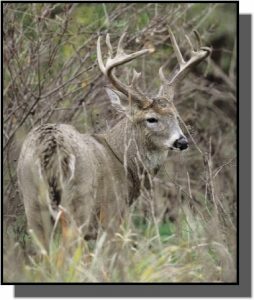 The peak of the whitetail breeding season, or rut, occurs in November. Young does usually have one fawn in May or June while twins are usually the norm in older does and triplets aren't uncommon. Each fawn weighs about 5 pounds. They can live up to 15 years in the wild. They are the most popular big game mammal in the United States. Distribution: White-tailed deer range from northern South America to Canada. They are typically found in woodlands or riparian corridors throughout Kansas. Food: White-tailed deer feed mostly at dawn and dusk on leaves, stems, buds, and bark. They also eat acorns, grain crops, and alfalfa.